Hallromm butterflies have thick pelt and long antennae, the six wings have a wingspan of half a meter, and the six legs are equipped with flexible toes that let them cling to nearly any surface. They are generally friendly and easily trained. Dustships started using hallromm butterflies as messengers long ago, but nowadays they are popular everywhere, especially after new breeds proved to be more cold resistant. They carry letters in strap-on belly bags, and in some places heavy in short range messages the air is fluttering with hallromms. The butterflies insist on their own bushes to which they return faithfully - dustships keep those on one of the floating rocks. 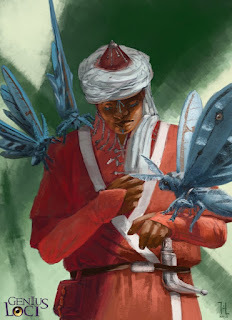 Hallromms enjoy having their bellies stroked, leave tiny marks on elvish skin, and are mildly intelligent, at least enough to play with the omnipresent bugfairies. "The bugfairies have painted the hallromms again. One almost lost an antenna trying to clean itself, but washing isn't a solution either, I'll break them to pieces. I'd ask the fairies to fix it, but I'm scared of what they'll do - probably paint the original colours back or something." Originally hallromms (German: Hallrömm) were only found on dustships, but somehow a few years passed in Genius Loci while hallromms were around, and then they were popular on the ground as well. This is actually the first painting of them, I had just a few scribbles of their anatomy before. Most of Kitas is rural, many peoples are nomads, and have settlements they only use half the year or even only tents. Notable cities are the three council cities for one - Gamahan in central Sawa, Plokin on Lozir's western coast, and Clom Vah in the Gderan Mahal Bay - gigantic cities dating back to the dawn of time, each over a million inhabitants large with uncounted visitors. It's here that all countries of the continent gather for talk and trade, and the council cities regard themselves not as power players but mitigators. 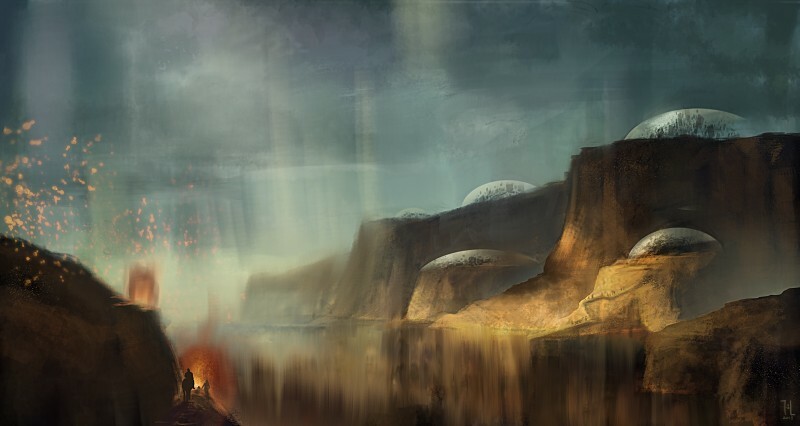 Secondly, the rhu'khach cities are the next oldest and therefore largest settlements. Recognizable by the ending -ei or -ai (like Agorisai or Eligei), their architecture is unmistakable, and their infrastructure is well-planned. "The architecture of Akosh and Ukosh is quite pleasant, even if the denizens are weird, but I like Nalvar's Isuanda best. It's beautiful at every time of year, and not as crowded as the council cities." There are many other notable towns and cities; there is some debate however, dating back millenia, if the likemindedness of city dwellers doesn't attract placespirits too easily, and thus, growth of settlements should be discouraged altogether. The inhumanity of seeing this through stops doubters from acting - usually - but the debate remains, and indeed, some peoples believe it firmly enough to not gather in settlements larger than small villages. 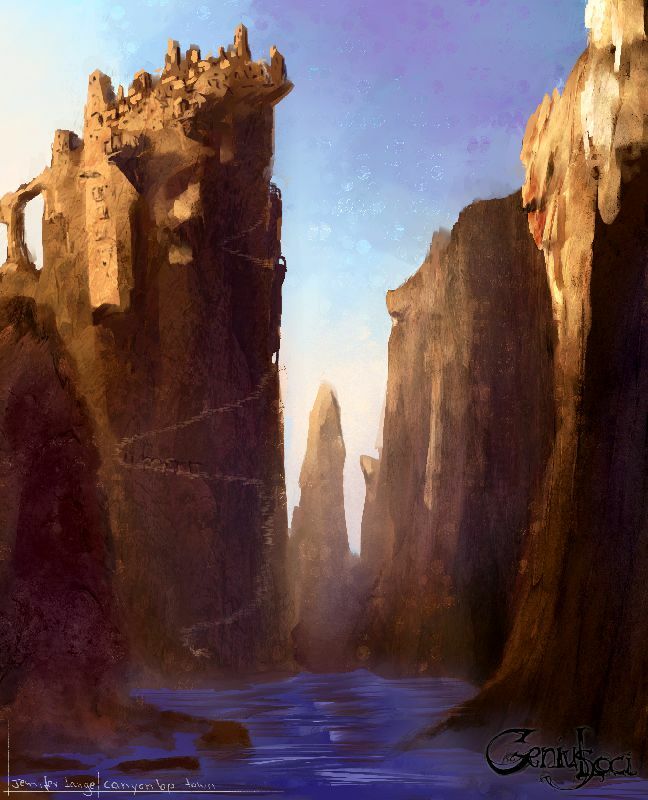 "The Discordant Cities have irked Zir again with a newly hired pirate fleet that Grimoga set on Henasset, but that attacked Ziranian traders, too. I don't think Zir will be forgiving about their idiotic politics much longer." 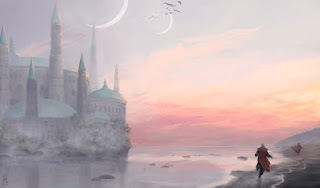 Other famous cities are the powerful Nalsiir in eastern Gdera and Elisacett in its far south; the Tritowns Nini, Oryor, and Drani; Brighthold's capital Sokarnon; and the engineering school's home, Bargassa. Cities are such fun to invent and so painful to paint. Given that I arrived at a world pretty much littered with relics and ongoing spells like autumn leaves covering the forest floor, it might well be safer in the woods than in the cities, concerning otherworldly entanglements, where much fewer people have come through who could have left trouble behind.